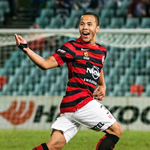 Highlight: Scored on debut for the Wanderers against Perth Glory in Round 27 of Season 2014/15. Description: A talented midfielder, Youlley was expected to progress into the first team, but failed to make an impact after his debut season. Replaced in the first team calculations by other young prospects, he was released, joining Sydney Olympic in the NPL at the conclusion of the 2016/17 season. wish him game time and all the best. should he get better and return to us i'd take him back in a heartbeat.